Why is it called a Red-Bellied Woodpecker? 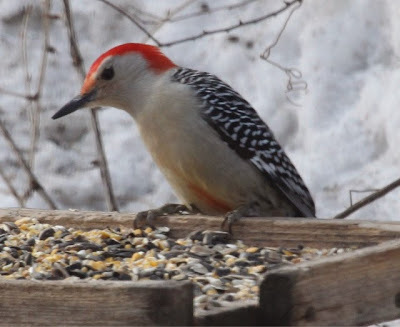 As I show birds to kids I often get a question about red-bellied woodpeckers. It's not so much a question has a statement, they usually say, "Hey look, a red-headed woodpecker!" While it is technically possible for a Red-headed woodpecker to show up where I work, this isn't what they are seeing. Invariably, they have pointed out a Red-bellied Woodpecker. It is an easy mistake to make. The birds are large, conspicuous, and sport a very red stripe down the back of the head. Red-headed woodpecker would be a great name for this bird if it wasn't already taken by this beauty. The bird above is the red-headed woodpecker. As you can see, the whole of the head is a deep red and the belly is clean white. The bird below is a red-bellied woodpecker. I took this photo toward the end of the winter. As you can see, the red is only on the back of the head. It isn't an award winning photo by any means but I wanted to share it as you can clearly see the "red belly" as the bird is feeding off a tray feeder. This seems like a terrible name for a bird. They mostly feed while keeping their belly pushed up against a tree which hides the field mark they are named after. Keep in mind though, that while we study birds today with binoculars, they were primarily studied with guns in the past. Ornithologists would go out in the field, shoot birds, and then study them later in hand. It seems awfully strange to us today but especially before high quality binoculars and spotting scopes existed, shooting the birds really was the best way to identify and learn more about them. The red-bellied woodpecker, and others like the ring-necked duck, have names that are hold-overs from a time when birds were best studied post-mortem and in the hand. Remember, a bird in the hand is worth two in the bush. What bird names have you always thought were puzzling? That's the worst one. I know the difference and still pronounce "Red-Headed" half of the time. Call it "Red-Capped"? "Quirring"? "Ladder-backed" is taken. "Tan-faced" isn't specific and just sounds boring. I'm also strongly against some geographically named warblers. "Connecticut", "Tennessee", "Nashville", "Cape May", "Magnolia". I don't have replacement names yet. Very interesting, Kirk -- thanks for pointing out the difference. Now I just have to keep an eye out for both. There are so many bird names just like this, where they only make sense in reference to some other bird that you may or may not be aware of: the "short-billed" dowitcher being one of my favorite examples. Then you have all the jays-that-are-blue-but-are-not-blue-jays, and the warblers-that-are-yellow-but-are-not-yellow-warblers, and the thrashers-that-have-curved-bills-but-are-not-curve-billed-thrashers. Thanks for adding one more example to my own mental list, and happy birding!